©Bert Gildart: Here are a few images that tell a story of a very significant place, one we’re been enjoying these past few days. Most notable is the one of Janie framed by a cave punched by weather into some igneous rock. 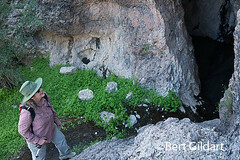 The cave is one of many and all are adjacent to Dripping Springs in Organ Pipe National Monument. Our visit is notable because this area of the park has been closed for the past 12 years. 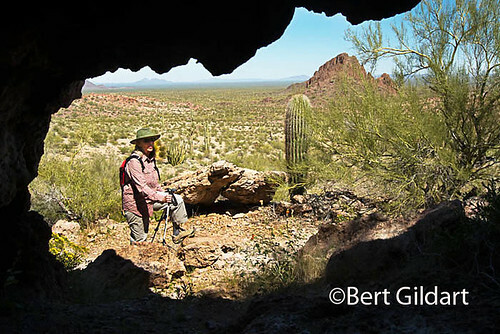 In 2002, as reported in blogs over the years, Chris Eggle was shot to death in Organ Pipe National Monument trying to protect visitors from the danger imposed by desperate drug smugglers. 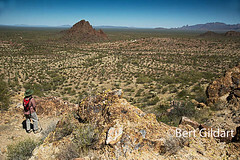 Mexico is just five miles to our south and until recently established drug routes have coursed their way through this outstanding area of the Sonoran Desert, representing, therefore, a continuous source of danger. But the work of park rangers and the Border Patrol has improved conditions. As a result, park officials reopened six miles of the Puerto Blanco Road this past December. Visitation to Dripping Springs is based on a quota system, and right now only five vehicles can travel the bumpy road at any one time. With a permit, bicyclists, however, can visit anytime. L TO R: Janie gazing over Sonoran Desert from Dripping Springs; biking to road to Springs, but stopping near compassionate Water Tanks; Janie and Springs. Park officials say if this experimental opening is successful, they are hoping to reopen the remaining 30-plus miles. Wouldn’t it be wonderful, they say, if we could open the rest of the park? Have not talked to anyone who would disagree. This entry was posted on Saturday, March 22nd, 2014 at 8:05 pm and is filed under National Lands. You can follow any responses to this entry through the RSS 2.0 feed. You can leave a response, or trackback from your own site.